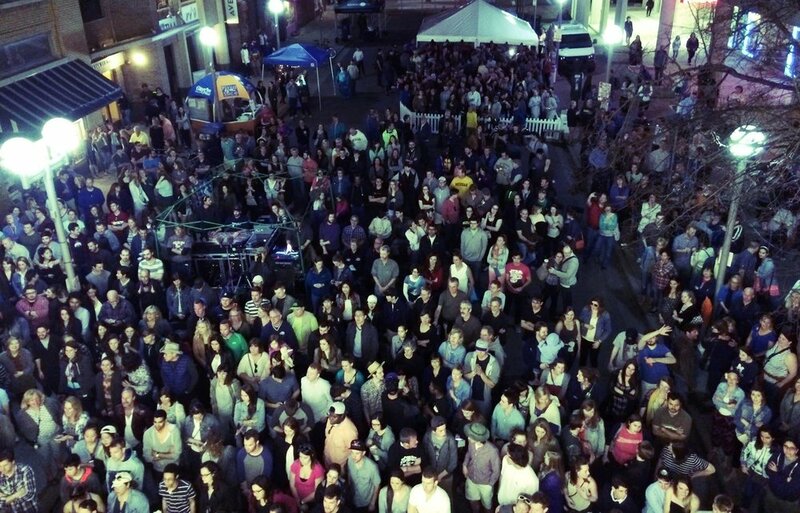 The State Street District is hosting its second annual Rock the District music festival. Building off of the success of the of 2016’s inaugural show, the District is once again providing a completely free concert on the corner of Maynard and East William. A jam-packed line up of live performances, curated by hosted by Sonic Lunch’s Matthew Altruda, includes Theo Katzman, The Go Rounds, Misty Lyn & The Big Beautiful, Chris Dupont and Girls Who Care. Theo Katzman, of the band Vulfpeck, headlines this night of artists, all of whom have roots in the state of Michigan. As Katzman has appeared in multiple funk shows with his band, he is eager to perform in front of his native Ann Arbor as a solo act to showcase his Rock and Roll sound. The Kalamazoo quartet, The Go Rounds, have also been a constant in the Michigan music scene over the past 5 years. Their powerful and dynamic live shows have earned them a reputation as one of the best live bands in the Midwest. In partnership with Ashley’s Downtown, this 5pm-10pm event will feature a beer garden providing cold beverages throughout the night. This Maynard block party serves as the perfect Ann Arbor venue featuring multiple access points and its surrounding of fabulous places to step away and grab a bite to eat. This amazingly free event, open to all ages, could not be possible without the support of Ann Arbor’s 107one. Ann Arbor’s State Street District is inviting families, students and everyone in between to come out and experience this exciting Saturday night. We started in 1993 with a vision of using vintage windows as home accessories and giving them another life as art. By appreciating the historic value and the beautiful craftsmanship of nineteenth century leading and beveling, we have enjoyed blending the beauty of these materials to create our own one-of-a-kind art pieces. We believe each person who appreciates our work is honoring their personal history and their past. Our newest items are clock head curio cabinets created from architectural artifacts. While mimicking the human form they are both functional and whimsical~ a new twist on the ‘grandfather clock’. Most of our windows date from the mid nineteenth to the early twentieth century. They are transformed into art by applying various finishes to the frames. The frames are painted for antiquity to create either patina or hand-rubbed, weathered glazed finishes. Terry Abrams has been teaching photography since 1975, when he moved to Europe to establish photography programs for an American college in Europe. He subsequently lived overseas for 13 years in England, Spain, Germany and the Azores Islands. During this time he travelled extensively throughout Europe, teaching Art and Photography. In 1988, Terry moved to Ann Arbor, Michigan and began teaching photography at Washtenaw Community College, where he is a full-time faculty member. As Department Chair for seven years, he guided the photography program through the transition from darkroom to digital photography and into a new building and lab facility designed for digital imaging. Terry has also been a Lecturer in Photography at The University of Michigan and conducts photography workshops at The Maine Photographic Workshops in Rockport, Maine. He co-produced the Great Lakes Digital Conference from 2003-2005, and taught workshops alongside the major innovators in digital photography, including Thomas Knoll, the inventor of Adobe Photoshop. Throughout his career, Terry continues to be a student of photography. He has had the good fortune to study with Arnold Newman, Paul Caponigro, Michael Kenna, John Sexton, John Paul Caponigro, Lewis Kemper and others. Terry Abrams has a BFA Degree in Photography from The Maryland Institute College of Art and Design, and an EdM Degree in Educational Leadership from Boston University. He also earned a Certificate in Photography from the Agfa-Gevaert Institute in Munich, Germany. In 2005, Terry was selected to participate in a Fulbright-Hays Group Project led by the University of Michigan to travel, photograph and study Islamic culture in Morocco and southern Spain. In 2010, he was hosted by the Turkish Cultural Foundation to travel and photograph throughout Turkey as a Cultural Tour participant. He currently conducts photography travel workshops to locations such as Morocco, Turkey, Italy, Spain, Scotland, Greece and Iceland. In addition to teaching, Terry creates photographs using the latest digital technology. His images are reproduced in books and appear regularly in exhibitions. He began working with digital technology in the 1990s by scanning 8x10 negatives he produced with an antique camera, but today is working mostly with high resolution digital cameras, software applications, fine-art papers and large-format inkjet printers to produce his photographs. Terry’s approach to photography is to produce images that communicate his visions of design and atmosphere both in black and white and color. His subjects include nature, landscapes and architectural elements from around the world.